This is a very interesting card, which I just had the pleasure of adding to the Herschel Hoard. 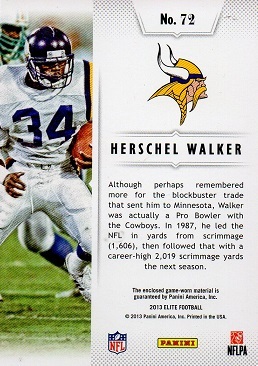 It is a 2013 Panini Elite Playmakers Jersey #72, featuring Herschel in a Vikings uniform. It also contains a jersey swatch, hence the name. 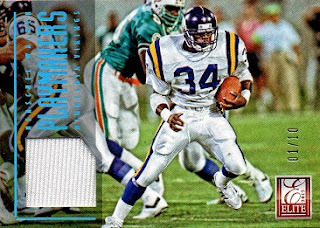 It is one of the more recent dates I've yet seen, which depicts Walker playing for Minnesota. The set contains 80 cards, with each one serial numbered to just 10. This example is #1 out of 10. Most times, with a card I haven't acquired yet, at least I have an idea of what the card looks like. However, I had never even seen this card before, and didn't even know it existed until I had a chance to purchase it. That's always a happy surprise for a single player collector. Congrats on the sweet addition. It is always nice to get a card that you haven't even seen.